Autumn can be the best time of the year for landing numbers of fish as well as the biggest fish of the season. As the waters begin to cool, fish will change location in any body of water – mostly to follow the feed! No matter what big fish you’re after, these seven points will help make you a more successful angler for late-season fishing action! The predator fish like bass eat lots and they eat big, so it’s smart to up the size of your baits. 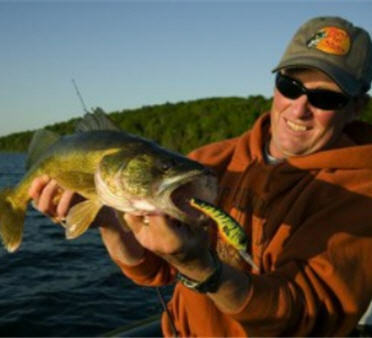 In muskie country, for example, serious anglers will seek out 12”-18”suckers to use as bait for voracious fall muskies. Bass anglers often find success with the biggest plastics and crank baits they can lay their hands on in the fall. Autumn marks the end of a long fishing season. You’ve been after them since the leaves on the oak trees were the size of squirrels’ ears – or some other such homespun indicators of the start of spring. You’ve put a lot of miles and even more abrasions on the line on your fishing reels. Change your fishing line now! There’s every chance you’re going to hook your biggest fish of the year this fall. Do you want to risk the potential trophy of a lifetime to worn line? At least give it a good look and make a decision on a reel-by-reel basis … but then again since you’ve got the line winder out … do them all. While fall’s fish are hungry, they’ll be less active as temperatures drop. That will mean slowing down your presentation whether you’re trolling or casting. Jigging is the method that gives you ultimate control on the presentation speed, so that’s why it works particularly well in the fall. The closer winter gets. The slower you go. That’s exactly what the predatory fish are going to do, so it’s what you should do, too. As the water cools, many species of bait fish are going to be seeking warmer water climes, so at least for the short term, that means the shallows. Look for fish hiding structure in the shallows like stumps, timber, and fallen trees in the case of big water bass. On the Great Lakes, be sure to check warm water discharges from power plants and the like – especially the closer you get to winter. That’s where the baitfish will begin congregating, and the big fish won’t be far behind. Despite the great fishing, in many locales – especially Up North — fishing pressure begins to taper in the fall. On trout streams, for example, you may have felt like you were fishing shoulder to shoulder in the spring. Come early autumn, chances are you’ll have those same stretches of the stream all to yourself. Many natural lakes in the North Country experience turnover in the fall. It’s when the water near the surface cools to the same temperature as the water near the bottom. When this happens, the layers of water reach the same molecular density and they “mix.” That’s turnover. Fish of all species like stability in their habitat, so lake turnover tends to slow fishing for awhile. However, you’ll find success quickly following turn over if you 1) focus on fishing lowlight periods including cloudy, breezy days and 2) find the bait. Again, following the feed is the Number One key to all fall fishing success. In fact, game fish are more concentrated during fall turnover than during any other part of the year. Most fish favor sharp breaking structure, and at this time you’ll find many species using the same holding areas. If you find them … bonanza! Come the end of summer, weed growth is at its heaviest and topwater fishing for bass can be at its most exciting. The trick is to find – or create – openings in shallow water weed beds that you can plop a topwater bait into. Following earlier advice, pick a large profile topwater fishing bait, something that will make a lot of noise and fuss. Plop it here. Plop it there. Make a spectacle of it … and hang on … prepare for the eruption!